I will admit to finding "planking" – the meme of having your picture taken while lying flat as a plank across something, and then posting it – to be both stupid and funny. To me the world needs more of this kind of inexplicable and absurd behavior (as long as it's harmless), not less. So of course somebody wants to criminalize it. Now, should you lay on top of a squad car? Probably not. Is it funny if you do? I think so. And if you don't damage the car and haven't interfered with the officers – neither of which was even alleged here – then what have you done wrong, exactly? 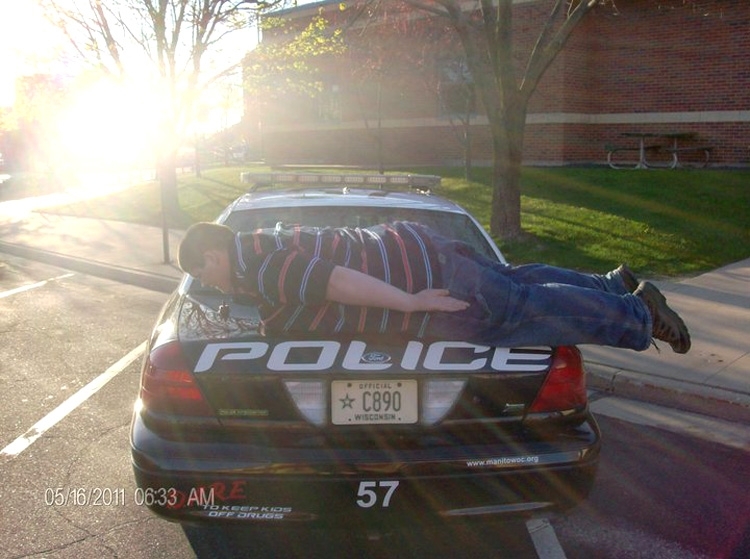 Other planks were planked at the local courthouse and in front of a police station, which are funny for the same reason the squad-car plank is funny. In one of the police-station planks, though, Alex Hart planked on top of a slab that bears the names of officers killed in the line of duty. Surely he did this only because the memorial is right in front of the courthouse, not because he wanted to mock the dead. This was a bad choice. But was it a crime? On 06-28-11, at 0938 hrs., I … made contact with ALEX. I explained to ALEX that I was going to show him a photograph, and I wanted him to explain to me the photograph, and why it was taken. I then showed ALEX the photograph, and he got a "blank" look on his face. After several seconds of not saying anything, ALEX stated that it was done "to get laughs." … I discussed with Alex that this type of behavior was not only disrespectful, but could also potentially cause damage to the squad [car]. On 06-28-11, at approximately 1120 hrs., I received a phone call back from RYAN. I explained to RYAN why I wished to speak with him, and inquired about the photographs. 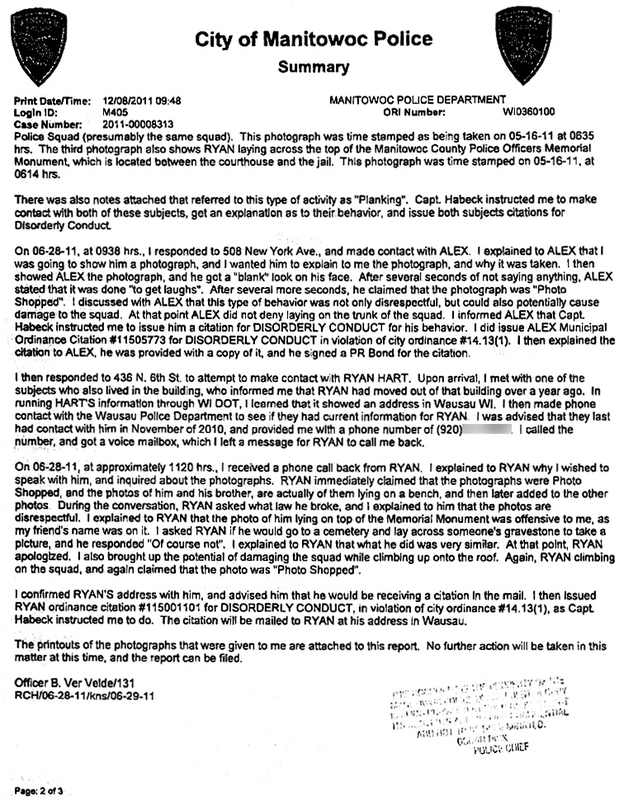 … During the conversation, RYAN asked what law he broke, and I explained to him that the photos are disrespectful. Emphasis added. ALEX Alex was fined $303 for "disorderly conduct," and Ryan was later found guilty of the same offense by a different judge and fined $429. According to The Smoking Gun, Alex was busted for "marijuana delivery" just hours after his conviction for disrespect, and while that is a crime (for now) it is hard to see the timing as coincidental. Manitowoc should be ashamed for a couple of reasons. First, its police evidently have no sense of humor. I'm not surprised Alex had a "blank" look on his face after being asked the phenomenally dumb question "why was this photo taken?" You don't have to get CSI involved to know the answer to that question. Second, and much more importantly, they think citizens are legally required to show them respect. This is not just wrong, it's dangerous. And it is invoked all the time, unfortunately, when people are "disrespectful" to police. Doing this is rude, but it is not a crime, an issue on which the ACLU and others have repeatedly won. Often this is on First Amendment grounds, and in this case you could certainly argue that the planking wasn't "speech." But if it wasn't speech or at least expressive conduct, it couldn't have been "disrespectful," either. And since Alex didn't actually damage their delicate squad car, where's the harm? If I recall correctly, the American Revolution was basically a big "F&$# You" to the King, so the right to "disrespect" authority is sort of built in, don't you think? 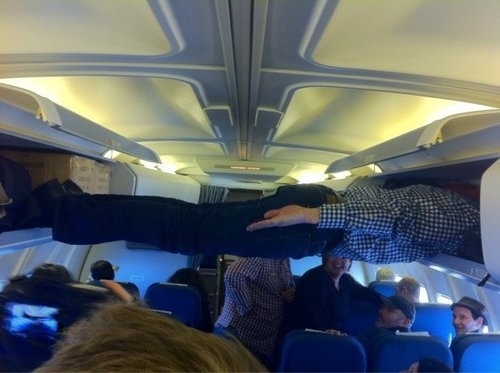 Wisconsin, let the plankers plank.